Crystal Oasis for the Winter Solstice, 1982. “There is a splendid symmetry in the exhibition of works by sculptor Rockne Krebs… It begins with the way the show is arranged in perfect balance: on one side of the Corcoran’s great atrium staircase is displayed in all its richness a retrospective selection of Krebs’ drawings from 1965 through 1982, and on the other side, the artist has placed one of his spatial structures, Crystal Oasis for the Winter Solstice. On the one side, we are able to study as never before the complex development of Krebs’ sculptural ideas and work from the time he first arrived in Washington. And on the other we are able to experience directly just what the drawings are all about. From this ideal union comes a tremendously enhanced appreciation of the hard-won clarity and depth that Krebs has been able to bring to his art. In a way Crystal Oasis does not need such support. 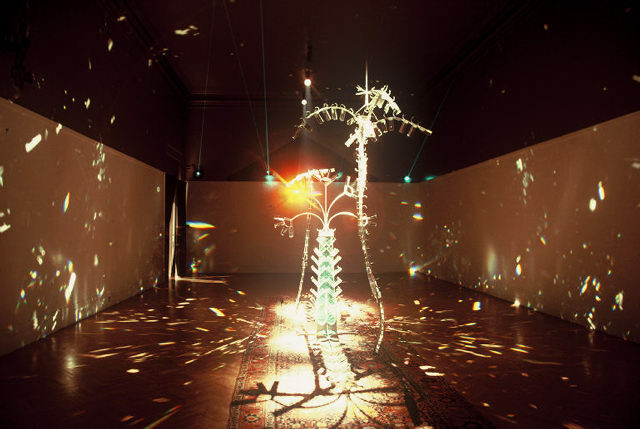 Like Krebs’ previous environmental structure, this one stands on its own and is magically beautiful: three crystal palm trees shining in the middle of a darkened room. But the experience is unquestionably intensified by an understanding of how the artist reached a point of such seemingly effortless mastery. But the rapidity with which he expanded his range of interests and his artistic vocabulary remains impressive to this day. Recognizing the vast space-framing spatial potential of a new instrument – the laser, invented in the late 1950s – he conceived his first laser environment in 1967. 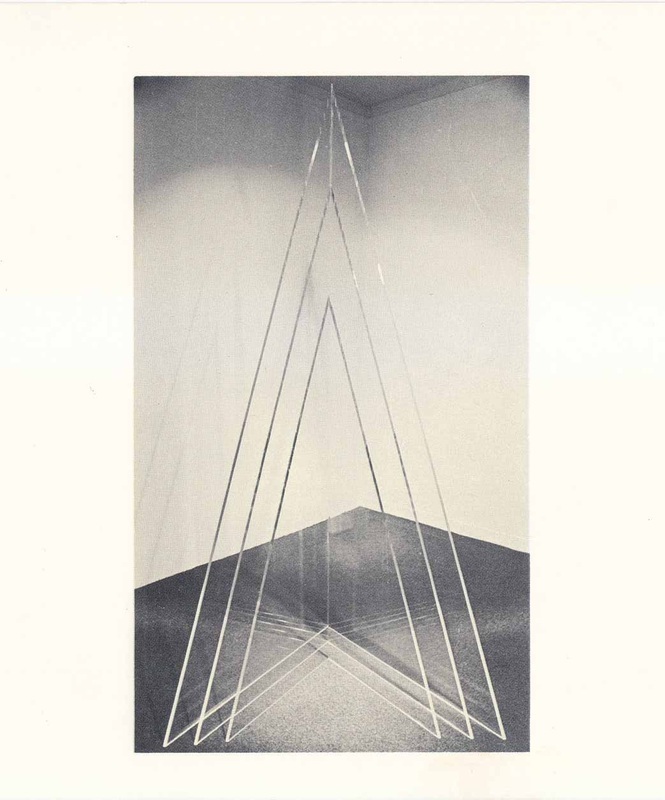 In 1969, on the occasion of the memorable three-artist Washington show organized by Walter Hopps (Krebs, Gilliam and McGowin), he began to use sunlight as a means to structure space. At about the same time he began to experiment with prisms as a means to the same end. In 1970 he created his first outdoor laser piece. In 1971 he first conceived the idea of using a camera obscura, on a grand scale, to expand sculptural space by projecting the outside world into the darkened rooms where his environments were installed. These exhilarating experiments and discoveries are recorded in the drawings of the time, as well as his experiments with other immaterial means of forming spaces or adding to them… All the while Krebs’ stylistic vocabulary retained a strong, linear, classical sort of severity. If there was intellectual fire at the heart of the activity, it was expressed with icy purity. Gradually he began to bring the two sides together by learning how to deploy the full battery of his skills and tools in the larger laser environments. Among the devices he used were projecting real images upon walls by way of prisms mounted upon skylights (the huge eye in his piece for the Omni Center in Atlanta), and constructing laser housings that also functioned as independent, indoor sculptures (the “Home on the Range” construction for a cityscape laser in St. Petersburg, Fla.). Above all this completion of Krebs’ art seems to have come from his dawning perception of the world as a unified whole to which every piece contributes – science, technology, his own artistic ego, man-made objects and the panoply of the natural world… His later works, frequently including images such as horses or trees, simply acknowledge more explicitly the ecological, spatial and symbolic possibilities. Ahlander, Leslie Judd. Art in Washington 1969, 1968, published by Acropolis Books.